This is the moment a holidaymaker came to the rescue of what he thought was a dolphin - before realising it was a shark. Nicolas Andre went to the aid of the stranded 12-foot creature after it got stuck in shallow waters near Lizard Point in Cornwall. 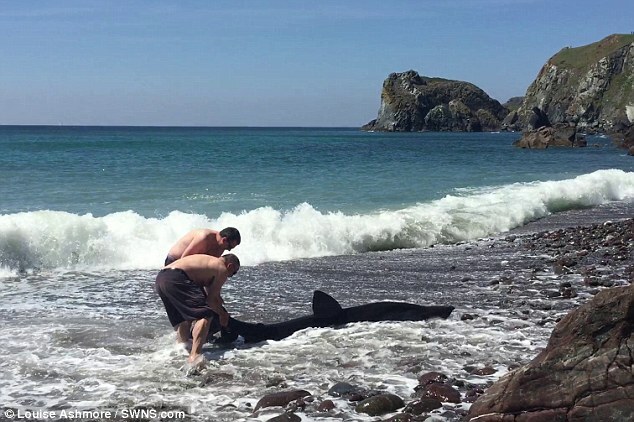 After running to help in the rescue, he was stunned to realise it was actually a basking shark. Mr Andre, 49, from Durham, was out walking with his wife Ann, 57, on the coastal path between Kynance Cove and Lizard Point on Monday when they spotted a couple wrestling with what looked like a dolphin on the shoreline. He said: 'The beach had no access, but I legged it down the hill anyway. 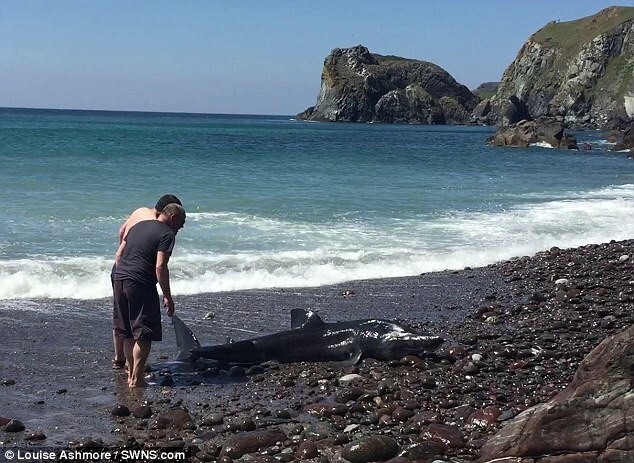 'I started to help the man there, and I realised that it was not a dolphin but a basking shark of about four-metres in length. 'Mr Andre wrapped his t-shirt around the shark's tail and helped the other man pull the animal back into the water - ripping his t-shirt to shreds in the process. He added: 'The shark's skin was very abrasive and there was far too much weight. 'It took a few attempts to pull it into the sea as we were waiting for the waves.' He added: 'When it was back in the water, I took my t-shirt off the tail and it was a like a switch had been flicked - the shark just flew off. Responses to "Holidaymaker thought he was rescuing dolphin realised it was a shark"